Mt. 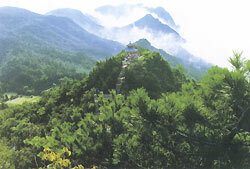 Lushan stands in the northern part of Jiangxi Province and borders the Poyang Lake to the southeast. Within this 302-square-kilometer scenic area are 16 natural wonders, 474 scenic spots and 171 spectacular peaks. The majestic peaks are shrouded in mist, the rushing waterfalls throw up blossoms of whitewater, and the springs sing as they flow across the rocks. More than 3,000 species of plants decorate the valleys and mountain slopes. The unique remains of the Quaternary Period glaciers add mystery to the mountain. Poyang Lake at the foot of the mountain is home to one million migratory birds. The largest flock of cranes in the world dances on the lake, creating one of the world's true wonders. Mt. Lushan has along history. Tracks from remote antiquity reveal the lives of our ancestors. Some 2,000 years ago, the historian Sima Qian of the Han Dynasty climbed the mountain and recorded his visit in Records of the Hishorian. The White Deer Cave Academy of Classical Learning leads the four to China and enjoys a high reputation in the history of Chinese education. The Donglin (East Forest) Monastery, built by a monk during the Eastern Jin Dynasty, is the birthplace of the Pure Land Sect of Buddhism. Throughout history some 1,500 famous people visited the mountain and left behind some 4,000 poems 900 carved sculptures and numerous paintings and calligratphle works Some 600 villas on the mountain slopes reflect the styles of 18 ethnic groups.